In my application, running cables wasn't easily possible, so twisted pair and fiber connections were out of the game. PLC-based networking is absolutely unacceptable as a HAM radio operator, because these devices produce lots of interference and noise. The distance is a bit too big to utilize "regular" WiFi links, so a different solution was needed. A rather unusual idea came to mind: (Mis)using existing 75 Ohm satellite TV coaxial cables. These wires were already present in the house, are nicely shielded and can handle high frequencies well. Their normal operating frequency is about 1.9GHz. The best solution would be to use a standard like DOCSIS and then utilizing the full bandwidth possible with these cables. Unfortunatly DOCSIS CMTSes are really big and expensive, so I'm not going to be my own little cable provider (although that would be cool :D ). The other solution to data transmission via HF is plain old WiFi. From my old WiFi installation I still had a pair of these TP-Link Archer C7/AC1750 wireless 802.11ac access points. 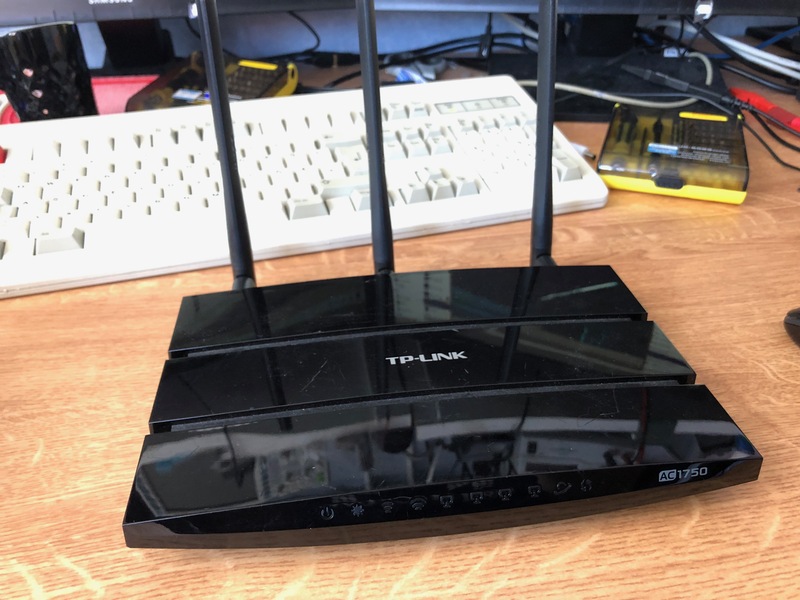 They are well supported in OpenWRT and use an Atheros chipset, which allows for WDS-mode operation, so Ethernet bridging over WiFi would be possible. - impedance mismatch -> WiFi uses regular 50 ohms, while TV coax is 75 ohm. Because I didn't have any u.FL to F-connector or RP-SMA to F-connector adapters, I borrowed some u.FL to SMA pigtails from my LimeSDR. Common SMA to F-connector adapters were then used to connect the coax cable. Unfortunately, the results weren't as good as I'd hoped. The WiFi interfaces synced up with 175 MBit/s, which means that the link was using QAM16 modulation instead of faster QAM256 mode. With 175 MBit/s sync, about 60 MBit/s of real data throughput was achievable. The WiFi modems inability to switch to better modulation schemes is probably down to multiple factors. A quick look into the Wikipedia article on 802.11ac modes also shows that this connection was using the larger 800ns GI, which is probably down to the impedance mismatch between the 50 and 75 ohm systems. Reflections in the cables interfere with the signal and the modem switches to the larger guard interval. Those same reflections probably also limited the modulation to the QAM16 constellation. The WiFi adapters were already running in AGC mode, because increasing the TX power on both sides didn't change the signal levels or SNR. Maybe using high quality RF attenuators in this setup could actually be beneficial to help with the impedance mismatch and too strong signal levels on the coax. So, in conclusion: WiFi over satellite coax works, but not impressively well. 60 MBit/s with standard off-the-shelf equipment can still be enough for many applications, which is why I'm documenting this experiment here.